A beef fajita recipe fits perfectly into your low glycemic eating plan when you use low glycemic, sprouted wheat tortillas. Chicken or beef works or a combination of the two. The one pictured above made from this recipe tastes fantastic! There are several brands of sprouted tortillas available now in natural foods markets or in the natural foods section of your supermarket. Food For Life, Alvarado St. Bakery and Ezekiel are some brands for some great sprouted grain tortillas. My personal favorite right now is made by Alvarado St. Bakery. They all have a lot of texture and excellent flavor! You know what else makes the flavor difference in your fajitas? Use fresh salsa or a reliable commercial brand without preservatives. And be lavish with the guacamole and the salsa inside your fajita - yum! The best store bought salsas will be in the refrigerated section of your super market. This fajita recipe is one of our printable low glycemic index recipes. Arrange the steak or chicken in a single layer in a nonreactive roasting pan just large enough to hold it. Pour the marinade over the meat, turn to coat, cover and refrigerate all day or overnight. Honestly though, if you only think of it at night and marinade even an hour, it'll be good. You can toss it several times while it's marinating. 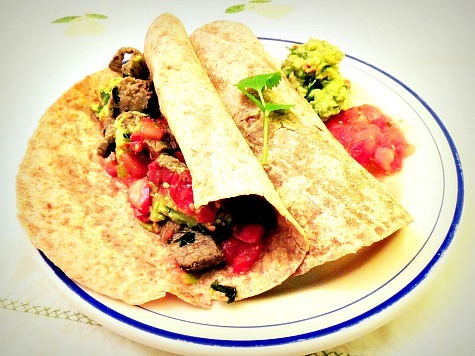 Before you cook the meat, roll and wrap your sprouted wheat tortillas in aluminum foil. You can warm them on the fire or in the oven while the meat is cooking. Prepare a charcoal fire or preheat the oven. Pour off the marinade and sprinkle with 1/2 teaspoon of salt. Sometimes if you don't get a lot of juice from the limes the meat will soak it all up. That's ok. Grill or broil for 3 minutes each side for medium rare. Sauté 1 small green or red bell pepper and 1/2 onion sliced in thin 1" strips in 1 tablespoon of olive oil and add to the marinated meat. Serve with sliced avocado or guacamole and a couple of heaping spoonfuls of fresh tomato salsa. Scroll down the page for the salsa recipe. Note: These fajitas are big and juicy, you only need one. Serve them with beans and salad. This fajita recipe goes really well with our salsa recipe. Serve with a simple salad of greens, crumbled feta cheese, peeled and sliced cucumbers, tomatoes and olive oil dressing. Make a salad dressing of 6 T. of olive oil and 2 T. balsamic vinegar with a 1/4 teaspoon of salt and a good sprinkle of pepper, shake it thoroughly and keep on hand for veggies or salads. With the guacamole (omega 3 fatty acids) and a great salad you've got all the nutrient bases covered! Return from Fajita Recipe to Low Glycemic Recipes. Return from Fajita Recipe to Lifetime Fat Loss home page.